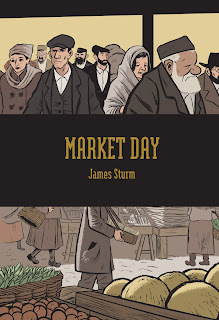 Market Day by James Sturm was a book I picked up on a whim while passing time at Borders, and I'm glad I did. 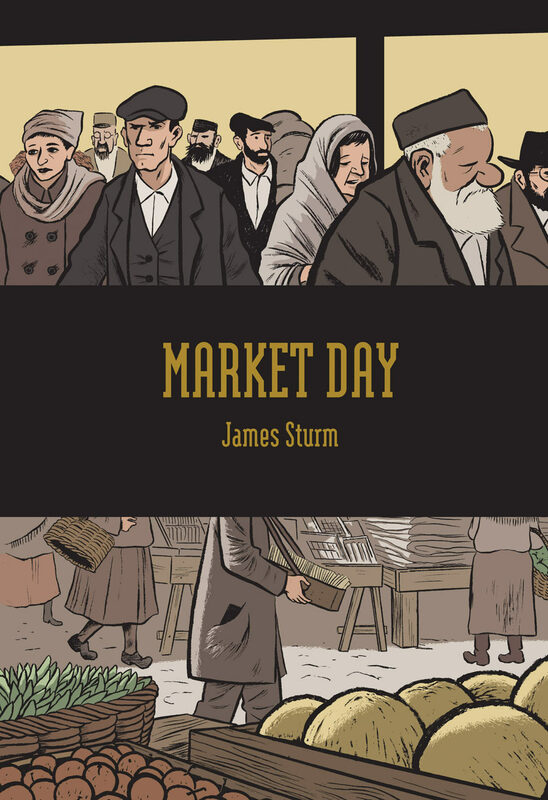 As I am still new to graphic novels, I had never heard of Sturm (though he seems to be a Big Deal in comics-land). But I really liked the premise of this book, and it was a pretty slim volume, so I picked it up. Market Day is about Mendleman, a Jewish rug weaver living in Eastern Europe right around the Industrial Revolution. He is a dreamer who loves his art, but with a pregnant wife, he also feels a lot of pressure to provide for his family. He sets off one morning to the town for market day, taking eight rugs with him to sell at one of the most respected shops in town. However, when he arrives, his buyer no longer owns a shop, and the new shopkeeper refuses to buy his rugs. This sets Mendleman into despair, and we follow as he tries to find another buyer for his rugs in town and then further afield. 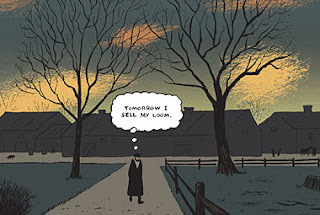 As the day turns into night, Mendleman becomes more and more worried about his plight and how he will manage to balance his passion for high-quality workmanship with his need to provide for his family. I really enjoyed this book! For such a slim volume- a graphic novella?- it has a lot in it. I loved Sturm's use of colors. Mendleman is a very moody character, and Sturm alternates between dark colors and bright colors to show just how much Mendleman's feelings jump around. 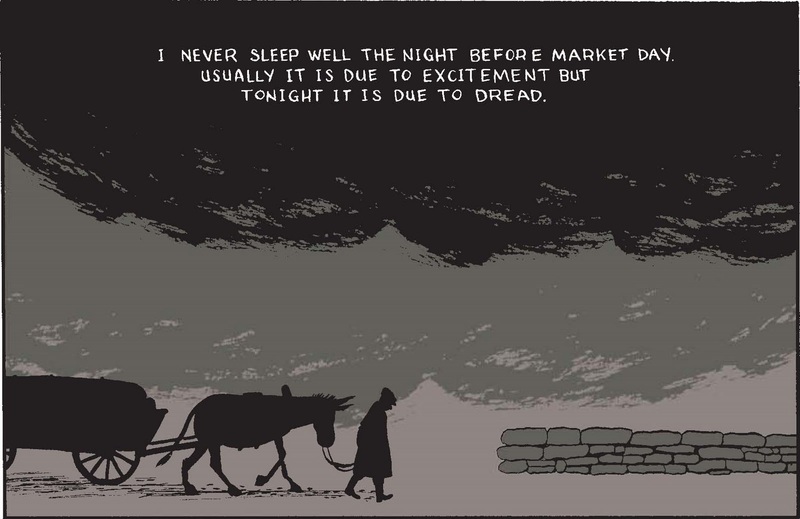 The book starts dark, as Mendleman wakes up early in the morning, dreading his trip to market as he must go without his wife. Then, as he approaches the bustling town with all its colors and noises, the color palette expands to show us just how fun and exciting market day is. We see children laughing and friends chatting. Later, though, when Mendleman is depressed once more, we see starving dogs, cruelty towards the poor and other less-than-happy visions. Sturm could easily have made this book only about the clash between artistry and cost and the way that industry can kill artistry, but he did not. As a reader, you sympathize with Mendleman, but you don't quite trust him. His feelings veer from happiness to despair a bit too easily. He seems to give up on the possibility of selling his rugs after just one setback. He doesn't seem thrilled about his wife's pregnancy. His friends don't take his declarations seriously. He himself admits that he is more of a dreamer and his wife is the practical one. There is a lot more going on in the story than just quality vs. cost tug-of-war, which I greatly appreciated. While Sturm wrote this story about the struggle for art in a manufacturing world (as he details in an excellent interview), he also makes it about the inability of some artists to see beyond their work to basic needs. He makes it about the pressures faced by a new father who struggles to provide for his family. He touches on Jewish culture in Eastern Europe at the time. Sturm also implies that there may be a sequel in the works, showing how Mendleman's looming decisions pan out in the future. That would be fabulous to see. I don't know that I have much else to say here! This was a short book with a quiet theme, but one that I think resonates with anyone who has had to prioritize certain things above others. It is like one of those moments when you realize that you've lost your idealism- that you no longer believe that if you just do your best work, you will be rewarded. It's a hard lesson to learn, but Sturm describes that moment wonderfully in this novella. Wonderful review Aarti. I don't read many graphic books but this sounds like one I would like. 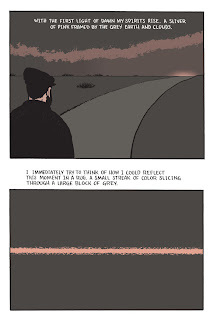 I love being introduced to new GNs - this one sounds like it packs a lot into a few pages and simple by powerful images. I still haven't read a graphic novel, and I think I'm missing out. This one sounds really good. At first I thought his plight sounded really sad, but I like the complexity, how he can't be trusted. I'm intrigued. I was hoping your review would come up soon! You mentioned the book to me but it's hard to tell from Goodreads if it'd be a book I'd like. I'd much rather see the review first, then add to my TBR (which I'm going to do right away, since you're right, this does seem good for me!). Teddy Rose- I think if you can find it, you'd like it, Teddy. Blodeuedd- I like the pictures, too! Care- Yes, it's so short but very good. Anna- Yes, I liked that twist a lot! Amanda- Yes, I think you'd like it, if you can find it! Loved this review! I like the fact that the author mirrors the protagonist's moods with the vista surrounding him, and I also like that you never quite know if Mendleman is a trustworthy fellow or not. I love it when books get into gray areas like that, and force their readers to make a choice that fits them. I would definitely be interested in reading this book. It sounds and looks wonderful! 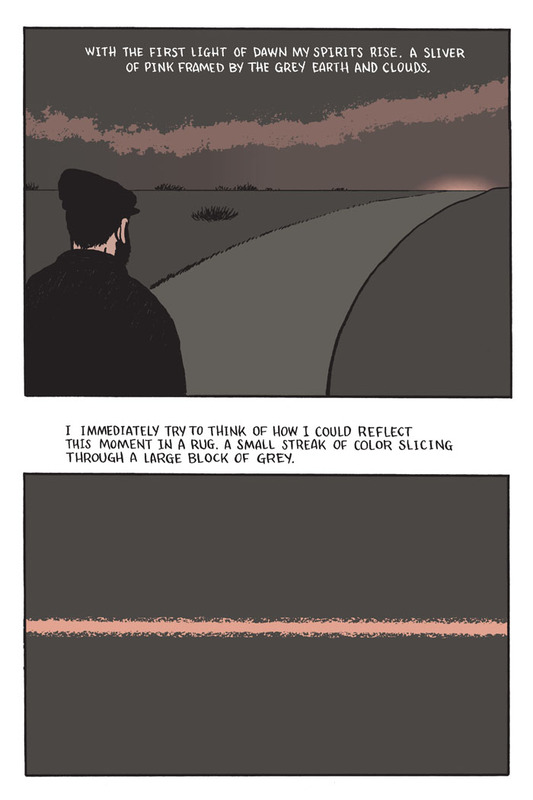 I don't think I've read a graphic novel that involves COLOR yet! One would think it could really add something and would be a little more common. I'll have to check this one out. This one sounds good (and looks good). Haven't heard of the author, but it looks like he's worth investigating. Wow, what a fabulous find. I love the look and the sound of this book. The pictures are fantastic too. Zibilee- Yes, I love how graphic novels can imbue symbolism into so many different aspects of the book! It's great. Andi- Yes, I am glad I randomly picked this one up! Vivienne- I think you would really like it, especially with the cultural aspects it shares. I've never heard of this before, but I like the look of it. It's neat how he's got such murky colors but very clear, sharp lines. Great review...of a book I've never heard of! I'm always stumped when it's time to write about graphic novels. I read Maus a few months ago and I have yet to write the review. I'm new to graphic novels as well, so thanks for the suggestion. This one sounds fantastic. Oh course I have to place this on hold after reading your great review! I'm with Jill. I'm stumped when it comes to reviewing graphic novels. I still should give it a try. Jenny- That's such a great way of putting it! Yes, I like that, too! softdrink- I don't think I review them very well, but I hope you choose to review Maus soon! Trisha- Yes, I think it's good! Vasilly- Ooh, I hope to see your thoughts on it soon! Okay, you were right :P I need to read this! Judging by those panels alone it does look like he uses colour in some amazing ways. Reviews like this one are the main reason why I finally decided to make my foray into the graphic novel genre. So far I've read I Kill Giants which like this book had many layers of things happening and much to make a reader think about. Thanks for reviewing this one. I'll add it to my list. At this rate my list is growing faster than I can ever hope to catch up with it. The colours are really vivid in the panels you showed, beautiful. I like that your picked out other aspects along with the central theme. So intrigued by the idea that readers won't quite trust the main character. I wonder if there's a satisfying resolution for him and for readers? Aarti - What a wonderful review. I have this on hold at the library and an now very excited about it. The art does look dark, but beautiful. Thank you! This sounds fascinating -- I am just sticking my toe in the water with graphic novels, since you inspired me to buy Skim. ;-) This sounds like something I'd like, and the artwork looks lovely. Kathleen- I haven't read I Kill Giants but I've heard a lot about it! Thanks for reminding me to look for it. Gavin- Thank you! I can't wait to hear what you think. Stephanie- Ooh, I can't wait to see what you think of Skim! This does look good. I have been on the lookout for some graphic novels to try. Thanks for the review! Great review, this sounds so cool!